Born in Alsace in 1761, the unsightly, diminutive Marie Grosholtz is quickly nicknamed "Little." Orphaned at the age of six, she finds employment in the household of reclusive anatomist, Dr Curtius. Her role soon surpasses that of mere servant as the eccentric doctor takes an interest in his newfound companion and begins to instruct her in the fine art of wax modelling. 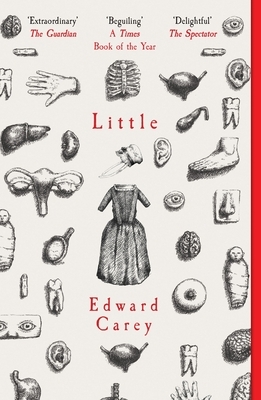 Edward Carey was born in Norfolk, England. He is a novelist, visual artist and has also written and directed a number of plays for the National Theatre of Romania and the Vilnius Small State Theatre, Lithuania. In England his plays and adaptations have been performed at the Young Vic Studio, the Battersea Arts Centre, and the Royal Opera House Studio. He is the author of the novels Observatory Mansions, Alva and Irva, and the acclaimed YA series The Iremonger Trilogy, which has been published in thirteen countries and has been optioned for film adaptation. After university, Edward worked at Madame Tussaud in London, preventing people from touching the waxworks, and it was there that he learnt the incredible story of the museum's founder. Edward lives in Austin, Texas in the United States, and teaches at the University of Austin. He is available for interview and to write features.